Rainbow Six Siege has never been so overtly sci-fi with its new operators. 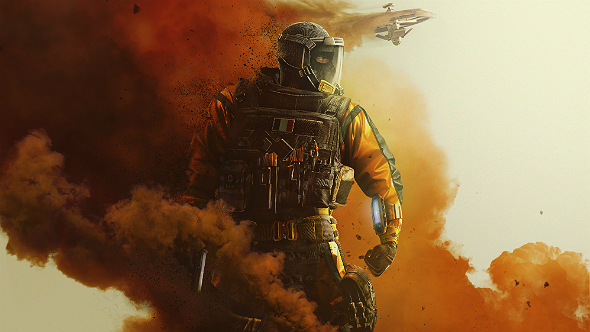 The new season introduces attacking duo Lion and Finka, who bring x-ray drones and healing nanobots respectively, not to mention primary weapons that have no real-world equivalent. 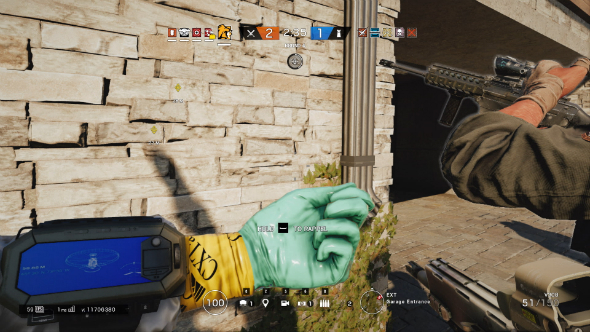 It is a drastic departure from the tactical realism we are used to from Siege. Whether or not this tonal shift bothers you is very much up to personal preference, but there is no ignoring what they add to the game: a necessary buff to the attacking side, global abilities, and some fiendishly clever attacking strategies. Want to know more about how these operators will fit into the upcoming co-op event? Here’s everything we know about Rainbow Six Siege Outbreak. The French attacker’s EE-One_D drone is truly terrifying. The gadget hangs over the map waiting for you to call in one of its x-ray scans, which highlight any enemies caught moving during its activation phase like a potentially fatal game of musical statues. Similar gadgets like Pulse’s HB-5 Cardiac Sensor only give you a dot to go on, but Lion’s drone offers a clear body scan of any moving enemies that stays active for a few seconds. This lets you locate them easily or track them around a corner, weapon at the ready. There is a hefty caveat to this, which is that enemies get a very clear warning before they are in danger. A notification tells them when the scan is about to be deployed, alerts them if they have been detected, and provides a countdown for when the device will deactivate. The clarity of these alerts makes it exceptionally difficult to get caught, but sacrificing even a couple of seconds of movement in Siege can be fatal. Roamers will have to halt their rotations, defenders caught in a firefight will have to remain rooted to the same piece of cover, and anyone in range of a Fuze Cluster Charge will be lit up one way or another. Playing as Lion I was able to time the EE-One-D so that it caught three players who were all fleeing from a Fuze Cluster Charge. I moved to apply some pressure with Lion’s meaty V308 while Fuze rotated to place a second Cluster Charge directly where the three defenders had shifted to, finishing them all off. 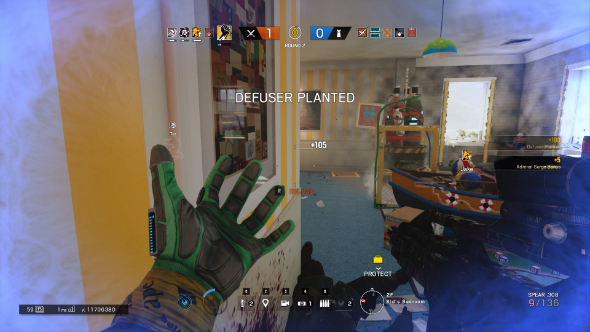 Another round saw us successfully plant the defuser, but two defenders were still at large. 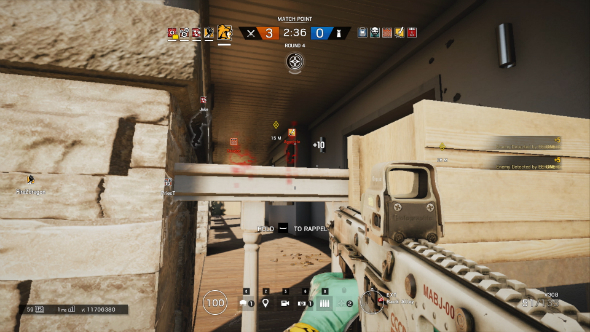 I deployed my drone, and as the defenders were running out of time both were moving when the scan started, which forced one to go on the attack and the other to run away – finishing off a round of Siege has never felt so easy. Depending on your preferences, this will either excite or worry you. But hours after the session I am still thinking of ways Lion will forever change the how players attack in Rainbow Six Siege and what synergies he will bring to the table. Imagine pairing him with Montagne or Blitz, who could force players to move, making killing them easy. Of course every operator has a downside, and from what I have played it seems that Lion’s weakness is his weaponry. The V308 is slow, unstable, and not quite damaging enough to make up for those shortcomings. As he is French, you can always run the 417 marksman rifle instead. Finka’s ability is a little drab compared to Lion’s, but her addition is nothing to be shrugged at. When deployed, her healing nanobots buff every teammate with a 20HP boost and steadier aim, both of which will stay with players for a short duration before dropping off. The cooldown for this ends just as the buff wears off, so you can chain all three uses together for a prolonged boost to your team. That is useful, for sure, but Finka’s best trait is that her gadget can also be used to instantly revive teammates from a down but not out stage wherever they are on the map. Well, in theory – multiple times I used Finka’s gadget only to see the downed player show up in the kill feed before they had managed to get to their feet. When it works however, it feels downright overpowered. In one instance, I ran straight into the objective room with the defuser and got downed just behind cover – Finka brought me back up, which allowed me to plant in peace before whittling away at the enemy team from inside the objective site. Like Lion’s ability, Finka’s promises to be useful in practically any situation, but game-changing when used with careful planning and coordination. Her buff is ideal for a late-round push where being able to tank a single bullet can make all the difference. Finka’s Spear .308 assault rifle impressive as well, offering great stability and recoil, which get even better when used in tandem with her nanobot buff. While it is not one of the most damaging assault rifles, it is still very capable of dropping enemies in four or five rounds. Moreover, Finka has no shortcomings as an attacking operator, ensuring the pair are a frightening addition to the meta that will inevitably see use at every level of the game, from casual to Pro League. What do you make of the new operators? Sound off in the comments below.